Safari Jackets There are 9 products. - Roma Jacket and Torino Jacket, both for men and suitable either for banqueting or for lunch; the first one is a classic jacket with shawl collar usually worn by waiters or commis de rang, the second one is a Mandarin collar jacket, normally used for catering and banqueting. - Pavia Spencer and Ragusa Jacket, a line for women, with two models enhancing femininity and elegance, being short; such as the corresponding men’s jackets, the first one is the best choice for restaurants, while the second one is more suitable for banqueting. This selection of hotel wear in Safari colour is completed by the relevant accessories, such as Tie, Nodino (short tie) and Bow Tie, and two aprons: Luino Apron and Alassio Apron, both ideal for banqueting, or simply for those who prefer wearing an apron even in the restaurant. 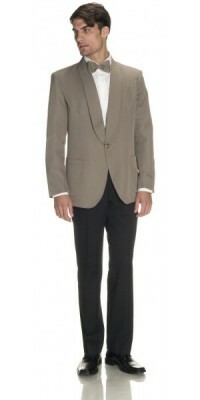 Men's jacket with shawl collar, model Roma one gold colour button, unlined Safari colour Immediately available for delivery: sizes from 46 to 56 Made of Gabardine Plus, 100% Pol. Short Women's spencer jacket, model Pavia unlined, one gold colour button Safari colour Immediately available for delivery: sizes from 42 to 48 Made of Gabardine Plus, 100% Pol. 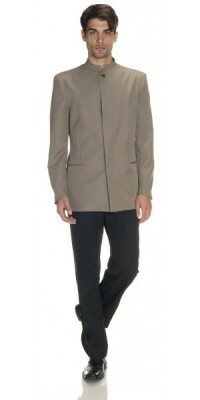 Men's unlined jacket with mandarin collar, model Torino with only one visible button in gold colour, and rest of buttons covered Safari colour Immediately available for delivery: sizes from S to XL Made of Gabardine Plus, 100% Pol. Women's unlined jacket with mandarin collar, model Ragusa with only one visible button in gold colour, and rest of buttons covered Safari colour Immediately available for delivery: sizes from S to XL Made of Gabardine Plus, 100% Pol. 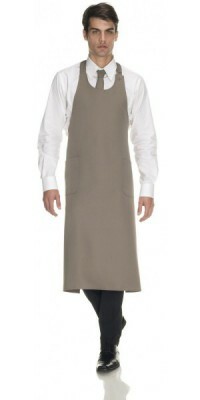 Long apron with bib, unisex, model Luino two pockets appliedSafari colourAdjustable one sizeMade of Gabardine Plus, 100% Pol. Short apron with bib, model Alassio two pockets applied - unisex Safari colourAdjustable one sizeMade of Gabardine Plus, 100% Pol. 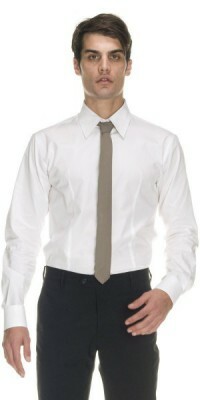 Narrow tie, model Seventy, unisexSafari colourone sizeMade of Gabardine Plus, 100% Pol. Short tie, model Nodinowith the knot already doneSafari colouradjustable one sizeMade of Gabardine Plus, 100% Pol.